LATCH, Inc. (and all other breastfeeding advocacy groups) has been working so hard for the past few months because the breastfeeding Rockstar is coming to Manila this August. Thus, we are inviting interested doctors, nurses, advocates, parents and community groups to attend this momentous event. Those who might want to distribute flyers/brochure prints to their clients can contact the e-mail address in the picture. 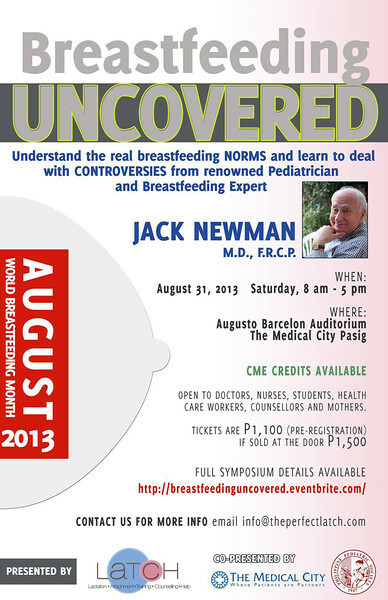 To register for the event, just visit the event Breastfeeding Uncovered registration site. Early registrants need only pay P1,100 (as opposed to P1,500 if you buy your tickets at the door on the day of the event). Intentional parents out there might also want to forward the link to this post or the event page to their pediatricians and other family doctors. The more doctors in other fields to attend, the better breastfeeding support families will get. The more government leaders to send representatives, also the better.